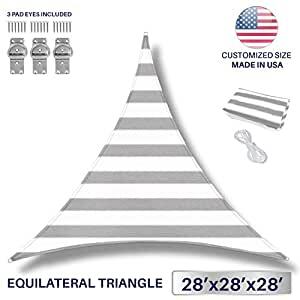 28′ x 28′ x 28′ (8.5m x 8.5m x 8.5m) triangle shaped sunshade sails block up to 95% of harmful UV rays. Can be used over a patio, driveway or other outdoor areas to block harmful sun lights. Has a 3-year warranty, and itâs easy to clean with mild detergent and water. It is fade resistant, and is free of mild, mildew and stains. Please contact our customer service at 628-715-4837 for further assistance. Or email us at cs1@ifencedt.com.